Line a 9” x 9” square pan with 2 criss-cross sheets of parchment paper (not foil) leaving extra overhang on all sides. Click to see how. Combine oats, brown sugar, coconut and extras in a large bowl. Add honey mixture to oat mixture and take time to combine thoroughly - about a minute. Spread in baking pan, pressing down very firmly. Try pressing down with the back of a spatula. How Do I Store My Granola Bars? click here. Bars not holding together? Try pressing them down again after baking. Let them cool for 10 minutes and press down firmly while warm, then let them cool COMPLETELY before cutting. Bars Too Brittle? Two Options: 1) Bake for only 27 minutes. 2) Place the 9 x 9 pan on a baking sheet to bake. That might keep the bottom of the bars softer. 176 Comments on "Granola Bars"
These came out so great! I was nervous because I only realized after I had put them in the oven that I had forgotten to grease the parchment, but they did not stick at all! They came out perfectly crunchy and chewy. Thank you so much! Just fyi, parchment paper never needs to be greased. Did not get crunchy but ate anyway! Really tasty! I have tried a few recipes, your no kneed ciabatta bread came out fabulous, did add some Italian seasoning in the 2nd time around and came out wonderful…Now I want to try your granola bars, has read all the comments, and saw where you had stated “coconut is used as a glue”…I don’s really like coconut, is there something else I can substitute instead of as glue? and they come out OK? I heard her say that it was the honey that holds it all together. Also other granola recipe sites say the same thing. No need to use coconut if you don’t want. Sometimes I leave it out and it does not change the texture. I love your channel and recipes. I made the granola bars twice and love the taste. I put in almonds, walnuts, dried cranberries, sunflower seeds My question is why it’s oily and the honey seem to sink to the bottom of the pan. I did toasted the oatmeal and nuts first. Is this making it oily? What did I do wrong? I read all the comments and no one mentioned theirs coming out oily. Thanks for the recipe. What kind of oil did you use, and what kind of oats? I will try to help. I used old fashioned oats and canola oil. It’s a bit of a mystery because I make granola bars every couple of weeks. I’m going to assume you used a 9 x 9-inch pan and if so, it might be you are not combining the mixture enough. It takes me about a minute of mixing, in fact I now do it with my hand and I will make that note in the recipe. Also you may not be preheating your oven long enough, or your oven calibration is off. Use an oven thermometer if you can. Try again and do not change the recipe in any way and please let me know if it helps. We live on these bars. Jenny your granola bars are delicious but I am upset after following the recipe to the T they r not sticking together it’s granola not granola bars what did I do wrong? Thank you and for all other recipes. Can you please list all of your ingredients and be very specific. And what size pan did you use? I make these all the time with no problems so I’ll try to figure out what went wrong. Perfect! Not to sweet. I have gluten intolerence some I substitue the oat by 1 1/2 cup of buckweet flakes and 1 cup of quinoa flakes. I press firmly before and after cooking. This is exactly what I was looking for. Bob’s Red Mill makes organic, Gluten-Free, old-fashioned oats. They’re really good, too! I found this recipe easy to make. I chose to add large chocolate chips, raisins, chopped prunes, and sunflower seeds. The husband loved this! I did too. It was perfect sweetness with the 2 tbsp. of brown sugar. I really didn’t taste the flaked coconut. But it was in there. It took me all of 5 min to get this all together. I think I was too impatient and didn’t properly wait for it to cool entirely. Some parts broke off as I cut it. But overall, it stayed together and I loved how shiny it looked on one side. I chose that for the presentation side. Thanks for the recipe. I will share it with all my friends. Great recipe and easy to follow! This Jenny – has not idea about how or what ingredients to use and what chemicals they contain. Everything can be made delicious by adding Sugar. Beware!! Wondering where I can find coconut that doesn’t contain propylene glycol? This is a known cancer causing solvent and it seems to be an added ingredient in recent years to flaked coconut. Also, can I substitute whole wheat flour in your pizza dough recipe? Thanks for your help! Can you please send a link to the research that shows it’s a known cancer-causing solvent? If this is true, I am not aware. Thank you. It was a book by scientist Hulda Clark, who later opened a clinic in Mexico so she could help cure people of cancer. Clark said that everyone with cancer tested positive for the solvent. It takes the liver 7 days to detoxify the solvent out of your body after you stop ingesting it. Good news though….I was able to find Bob’s Red Mill flaked coconut at my health food store, and it does not contain any harmful ingredients. Thanks! Hulda Clark died from cancer herself and her claims were widely dismissed as unfounded and potentially fraudulent. There is no cure for cancer, only treatment that, thanks to continuing research, is more and more effective and saves many lives. I only disagree here because I don’t want to scare people with inaccurate claims about a commonly used additive found in many foods and cosmetics, even deodorant and toothpaste. Correction, Bobs Red Mill flaked coconut is unsweetened. Can I still use it? Perhaps I can mix some honey with it? What do you think? Get unsweetened coconut instead. It’s minus the sulfate preservatives, too. Bob’s Redmill makes both flaked & shredded. Also several organic brands out there. Should the granola bars be chewy or crunchy? On the granola bars.. do you have to roast almonds and the walnuts or whatever nuts you use ??? The ingredients list “toasted” nuts so yes, toasting nuts makes them taste better. You can see my “How To” blog category to see how to toast nuts. I found them. Thanks Jenny!! I have looked all over your website and I love your recipes but can you please tell me what the mixture is that you smear in your pans instead of using Pam? I am asking about your bread I don’t have that type of pan can I put it in one of my good round pans. Sorry, I don’t know which bread you mean. I made these today..Delicious …only trouble they fall apart easily. .I put in freezer.Before I bag them individually. . I pressed really well before and right out of the oven..
Did you use a 9 x 9-inch pan? No Jenny, I used 8×8..But I’m not complaining. My hubby and I both say it’s a Keeper. YUMMY..I WRAPPED individually in snack bags stored in refrigerator. .We are ready for more…Thank you..
First off a big thank you for this excellent receipe . My husband and son loved the bars and they were super easy to make . My only concern is that they were not that crunchy and what I can do or change when I make it next time . And my son asked me if I can add peanut butter to the recipe and I am not sure if anyone had tried them . I added 1/2 cup of peanut butter and 1/ 2 cup of chopped peanuts and 1/2 cup of mini milk chocolate. I pressed them down before baking, 20 minutes into baking, and when they got out of the oven. Perfect and delicious!! My husband Joe and I will never eat any granola bars after making Jenny’s recipe. It is delicious, healthy and easy to make thank you it has become our daily dessert. Amazing recipe. Gave it to my trainer who agreed it was the best granola bar he’s ever eaten. Thank you, Jenny! Made the granola bars without the coconut. They came fantastic !! Thanks ! I made these three times , exactly as listed and they turned out delicious. Everyone in my family and my friends liked them. I will keep making them. Thank you so much for sharing the recipe!!! The instructions are also very clear. I don’t like coconut. Is it a must to add? I consider it part of the “glue” that holds the bars together. These bars r so yummy and my kids love them a lot.It is so simple too. I was looking for a simplified recipe for a kids baking class and I found exactly what I was looking for. I love the simplicity of the process and will use it for the class. I will come back and post the results on your page. I want to thank you for giving me a base to start my granola bars with. I have tweaked it so it can fit my dietary needs. I am gluten and peanut free. I also make it low sugar so i use agave for my husband. I hope it comes out good. However, your base is the perfect recipe thank you easy and simple. I told my husband now i can eat what enjoy and it’s not processed truly wholesome. Be blessed thank you. Thank you for the recepi, I’ll try to make it and maybe I’ll ask my son to sell it in his school, hope it can be his extra money. once again, thank you Jenny, God Bless you. If you follow the recipe exactly I think people will like to buy them. Just wrap them tightly so they stay fresh. Let me know what happens. I would like to know the calories for the granola bar. Thanks in advance. I’m sorry but I do not keep track of calories in my cooking. I will be making the granola bars tomorrow but the oil that I use for everything is cold pressed olive oil. Would that be OK to use? The flavor of the oil may be a little strong for these bars. I would recommend a flavorless oil. I might try coconut oil. I just wanted to ask if we double the quntities of your recipe , by how much longer would you say we should leave in the oven for? I would not recommend doubling this recipe. Granola bars can be tricky to hold together and I can’t guarantee they will turn out if you make any changes. In a 9 x 9-inch pan, a doubled mixture would be too thick and in a larger pan, it may be too thin. Can steel cut oats be used instead? Also, should any additional add-ins (chocolate chips, pumpkin seeds, ) be mixed in after the granola has baked and cooled? I believe you’re referring to granola and not the bars. I have only made granola with rolled oats but I have seen recipes that use steel cut oats. And yes, you would add dried fruit or chocolate chips after the granola is cooked. Seeds can be added before cooking. Granola bars can be tricky to hold together without crumbling so I can only guarantee my recipe if you don’t make any changes, even the size of the pan. If you make changes and it doesn’t work, I suggest you use my recipe exactly as written or you could look for a different (proven) recipe that uses the ingredients you like. Good luck! Can I use maple syrup instead of honey? Because I just read the article that honey gets purified and leave toxicity once it gets heated! Have you tried with maple syrup? I have never made them with maple syrup. I finally tried making these granola bars with maple syrup and they did not turn out. My guess is that’s probably due to the difference in viscosity; since maple syrup is much thinner than honey & maple syrup seems to also have a faster burn time ( super high sugar content). I used brown rice syrup, which worked great! I think agave would be similar, as they both have about the same thickness (and sweetness) as honey. 225 degrees…..Is that Celsius or Fahrenheit? It makes all the difference. In the UK, many of us cook with gas – so we have to convert. Please look at the recipe. It indicates the oven temperature of 325° F. There is also a metric conversion chart in my blog. coconut oil? I’m looking forward making this. Thank You. Blessings. I have never made them with coconut oil. I guess you would have to try or scroll through the comments to see if anyone has used it. Hi, Jenny I made the granola bars, I used coconut oil same quantity as in the recipe calls for the canola oil. . Superb taste. they held up did not crumble when I cut them into bars I used parchment paper and rolled them in it and place them in a cookie jar. Love this recipe. Will make them again. Thank you Laura M.
Thank you Laura I am going to make them tonight and coconut oil and coconut sugar is what i am going to use. I hope they come out good . Yes I use coconut oil. Works great! Jenny these granola bars are amazing! We have started a new healthy eating regimen since the new year and hubby was craving something sweet. These did the trick. My first try came out perfect. My question…can I add peanut butter to these? I am sure it would change the composition but could I make up for it with more oats, less honey, etc? Would love to hear your thoughts. I have never used peanut butter so you would have to try it. It seems to me they would not be as crunchy as they are now, even if you add more oats. Please let us know if you try. I did try it and they came out a little harder than I would have liked. Not really crunchy just harder. However, hubby won’t let me ever throw anything away. I sealed each one in a Ziploc snack sized bag and left them on the counter. Everyday I put one of the peanut butter and chocolate chip and one of the others I made (Craisins and pecans) and after about 10 days the peanut butter became crunchy like the others. I have no idea why. He said they weren’t stale. This time I will try baking them for a shorter time. I am working on them now. If you used peanut butter, it doesn’t sound like my recipe. I make these granola bars every week and if you follow the recipe exactly, including the size of the pan & baking time, they will be just right, and not hard at all. I used crunchy peanut butter. Works great! I was serching for a different granola bars other than the ” honey+PB+toasted oats” which I used to make. So, I found your recipe…..but hesitated to try….1/3cup of oil?? …….. OK, as long as I can use good oil (which I did use light olive oil) and use 1/2 cup chopped cherries +1/2 cup almonds+ 1/8 cup walnuts+ 1/8 cup dark chocolate chips (no coconut)….I love them very much!!!! Yeah, press them firmly before AND AFTER baking, cool down for 30 minutes, and use a sharp knife to cut. They turned out just look like store bought, but tasted much, much, much better (fresh, not too sweet, not too chewy or hard, but just fine☺)….. I am like Goldilock, a very picky girl. I highly recommend this recipe, and of course, I will keep making them too. Do I need brown sugar? Can I make them without the brown sugar? The biggest problem people have with granola bars is that they crumble. Every ingredient in my recipe works together as the “glue” to hold them together, including brown sugar. I can only guarantee my recipes when they are followed exactly, so you might be better off to look for a different recipe that does not use brown sugar. I left out the brown sugar and it did not stick together but I used it as granola and sprinkled it on my yogurt. I felt the honey to be sweet enough and used coconut oil. Very, very good. Much better than store bought. made these twice DELICIOUS FLAVOR –2 problems….difficult time filling pan (parchment paper kept folding over ) so I folded paper over edge of pan and help it down with wooden clothes pins….worked great….also, the granola bars came out great. but, they were a little to gooey/soft…they did not have that crunch that you had when you bit into it….did I over stir them to get everything moist…. I don’t think you can over-stir the mixture but maybe you could try baking an extra 2-3 minutes. I store my granola bars individually (air-tight) in the little mini zip lock snack bags and I keep them refrigerated. By the way, keeping them refrigerated will probably make them more crispy too. I’ve kept them as long as three weeks. Have you tried toasting the oatmeal first? I have WHOLE ROLLED OATS do you think it’ll work? I have never toasted the oats first. It seems like extra work when they will be toasting in the oven while baking. (I’m always trying to avoid extra steps). And I’m not sure what whole rolled oats are but you might be able to answer your own question by googling photos of rolled oats and see if they look like yours. I tried it and it stuck but I’m not sure if I greased it. Maybe if you greased it. Thank you for your quick response and this amazingly awesome recipe. My family loved them. By the way, I tried using aluminium foil and it worked. I just had to grease it as you mentioned. Granola bars can be tricky, mostly to keep them from crumbling, so I would only use a 9 x 9-inch pan. And if you’re going to buy one, I would not recommend glass or dark metal. You’ll likely get the best results with a light colored pan (I use Williams-Sonoma Goldtouch pans). Jenny, Thank you for your reply. I will not make the Granola Bars in the 8×8 and will buy an 9×9. The WIllliam Sonoma pan you spoke about is made by USA Pans for William Sonoma. Most of my bakeware is USA Pans and can be purchased at Bed Bath and Beyond. Have a nice weekend. I always use the dark metal and have no problems. I made the bars again and paid close attention to the measurements &I they came out beautiful. Thanks again for the advice u gave me from I last comment. If the bars were dark and a little dry, it could be they were baked too long or too hot, or maybe in a dark colored pan. If they were thin that could only happen with using different or less ingredients. If you used quick oats or less of any ingredients that could make them thin. I make these bars twice a month and in a 9 x 9-inch pan, with no changes in the ingredients, they will not come out thin, even if you press them after baking. I hope you’ll make them again and let me know how they turn out. Does the oven matter? I don’t have a middle rack, it’s only top and bottom and its gas. When I attempt to cook the granola bar, the top always comes out white-looking. It looks the way it did before I put it in the oven to bake it and the bottom is very sticky but the bars don’t stay together. Mine looked similar to how yours looked but like I said they were lighter so I’m guessing the oven has something to do with it. The oven does matter and I have never heard of an oven with no middle rack. It’s really the only rack that matters for almost all cooking and baking. The heat needs to circulate evenly around the pan for things to cook properly so unless you can find a way to fashion a rack in the center it’s going to be difficult. All I can suggest is to try to borrow a friend’s oven (a pan of granola bars is easily transportable) or try a recipe for “no-bake” granola bars. Could I substitute with normal coconut? And is it that necessary? I’m not sure what you mean by “normal” but if you mean shredded but unsweetened, that is usually dryer than the sweetened kind available in bags and I count on the moisture and stickiness of the sweetened coconut to help hold the bars together. If not, please explain what you mean by normal. It’s a combination of the sticky coconut, moist brown sugar, and honey that keeps these bars from crumbling. These are sooo good. I made 4 batches yesterday and we’ve almost finished them today. We’ve been clipping half the day and so the team is hungry and we needed healty snacks to get us through the last hours so we can reach our pound limit. OH MY GAWD these are good … I had to eat two at once just a minute ago because I couldn’t get enough of the flavor. We, of course used all organic ingredients, coconut oil, and threw in a bit of quinoa just to make the protein balance work out, but they were AWESOMENESS in a bar. Thank you, I wish I could hug you. omg Jenny made these 4x..cant get enough of them…delicious!! we call them Muslie Bars here thanks i will use this recipe often. Thank you for sharing! I have made it non stop since I found your recipe. It is so easy to make and so healthy as well. I only have quick oats and am in Africa where I can`t get the rolled oats. But I SO want to try these!! What can I add to offset the use of quick rather than rolled oats? I wish I knew. I tried making them with quick oats and they crumbled too much. You might be better to search for a recipe that uses quick oats. The “glue” that hold mine together is as combination of oil, honey, & coconut but I’m not sure increasing any of those would help. If you really want this recipe, I would try it with quick oats and make sure you press down really well before baking. Try using a spatula which you press all over using lots of pressure. But also do this: About 10 minutes after they’re done, use the spatula again and press down very firmly all over. And be sure to cool COMPLETELY before cutting. I hope this helps. I press three times, before during and after. No problem keeping them together. Love your receipies and your funny comments. I have a que about honey used in the granola bars. Could I use molasses instead? Thanks for easy recipes. You could use molasses but it would give them a much stronger flavor, possibly overpowering the other nice flavors. Hello! 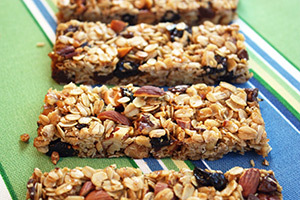 Made these granola bars yesterday and we all loved it, even my 3 year old is telling me she likes them a lot. 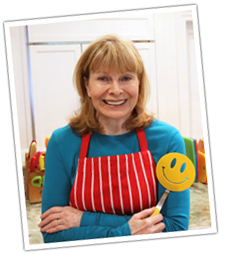 Thanks for all your great recipes Jenny! Hello! I just discovered your blog and I love it. Thank you for sharing these recipes. By the way can I use less oil for the granola bars? What is it for anyway? 🙂 thanks! Besides adding chewiness, I think the oil helps to hold the granola bars together so I’m not sure about using less. My kids love this crispy and tasty granola bar. they said i don’t want to buy from store any more. They shared with their friends. All asked me to make it again. Here i am making it and for sure my kids can’t wait to have it when they get home from school today. thx Jenny ! this is the best so far i can found. oh! i use different type of coconut (organic dry flakes without sugar) yummy . by the way, my baking time longer than 30 minutes. i think about 40-50 minutes for my oven with 325 F degree. This is such a good recipe 🙂 thanks you so much it work perfectly. I just made the granola bars last week and they always hold together for me. A couple of thoughts: 1) I assume you have not made any changes to the recipe. 2) Put even more pressure on them before baking. I now use a spatula and with the pan on the seat of a chair, I press a flat spatula all over while bending over and using my body weight to press down. Do this several times over the mixture, not just once around. 3) After baking, let the pan rest 10 minutes and press down hard again using the spatula. 4) Make sure you let the bars cool COMPLETELY in the pan. 5) Make sure you lift them out of the pan using the edges of the paper and not a spatula. 6) I store mine individually with each bar in a mini snack bag, air removed, in the fridge. I hope any of that helps. I believe you can just eliminate the coconut but if they don’t stick together quite as well you could add an equal amount (1/4 cup) of peanut butter, chopped dates, or raisins, all of which have a sticky property like coconut. Oi Jenny. Sou do Brasil (Moro em Recife PE). Estou a pesquisar por muitas receitas barras de cereais e encontrei a sua receita. Me parece simples e ótima ! Vou fazer para testar. Parabéns ! Bye Vou curtir seu facebook. Can we use aluminium foil instead of parchment paper ? I hope it doesn’t get burnt in baking.. I would not use aluminum foil as it sticks too much. Parchment paper will not burn in the oven. I make granola in Jamaica and one of the trick to binding is to soak the raisins/craberries helps to stick to the oats. If ur in USA Dollar Stores sell parchment paper as well as Sammy and Costco. Yeah it did turn out to be some very tasty granola cereal, guess maple syrup just doesn’t stick that well! A 9” x 9” pan. What pan size can i use instead because i don’t want them to be super thin or fall apart. If you have a 13 by 9″ pan, I would try doubling the recipe and use the larger pan. Let me know if that works. Would it be ok to freeze the mix instead of baking it? That’s a good question. I see a lot of no-bake granola bar recipes but most of them heat the liquids first, and most of them refrigerate rather than freeze. I have to believe they would not stay together like a baked one but you could certainly try it. The worst case would be they are crumbly but then you could still bake them. Let me know if you try it. Is it compulsory for me to use flaked sweetened coconut? Do you have any idea where I can get that in Malaysia? What is the function of the brown sugar? Can I replace it with glucose syrup? I look forward to hearing from you. You might be able to purchase sweetened flaked coconut online. The standard brand here is Baker’s. Both the coconut and the brown sugar have “sticky” qualities that help to hold the granola bars together so it’s hard to say how firm they would be without either one. Also, both the brown sugar and the coconut add much of the flavor to the bars. I don’t think you would have success replacing the brown sugar with glucose syrup because the bars might be too soft. It’s hard to say since I have only done my granola bars my own way so this is the best answer I can give. I want to try your recipe. I went to store and got the ingredients but I forgot shredded coconut, Is that required when making gronala bars? I have coconut milk at home, can I use that as a substitute? Please, please let me know because I would love to try to make these at home. Thanks much! The coconut has two jobs in these granola bars. One is flavor and it really adds a lot to the bars and the other is stability. Because flaked coconut is sticky, it’s part of the “glue” that holds them together. I would definitely not use coconut milk and if you make them without coconut, they may not hold together quite as well. I can’t say for sure because I always use coconut but they may taste okay without it but they may be a little crumbly. I’m going to try you granola bars. Do you have the nutritional value for the granola bars. I probably can figure it out, but if you already have them, it would be appreciated. I’m sorry but I don’t have the nutritional breakdown. I just watced your video and it seems really easy!I have ,though, a question and I will be really thankful if you could answer it. So, I am from Greece so I think it’s a little difficult to find canola oil! Can I use olive oil instead of canola oil? Ok! Thank you!! And another thing too…Does it matter If I don’t add the flaked sweetened coconut?? I think the coconut may be part of the “glue” that holds the bars together so well so I’m not sure what will happen without it. I might be okay but the worst that would happen is they come apart… and then you’ll have granola! Ok! Thank you for the advice!! Hi Jenny! I tried this recipe, the taste was awesome but it did not hold together as a bar like in your video. I’m not sure why, I pressed firmly and I even left it a little longer in the oven. It ended up being in pieces. Why did that happen? I have a couple of thoughts. First, make sure you watch my video because maybe you’re doing something a little differently. The two ingredients that are the “glue” that hold the bars together are the coconut and honey. Make sure to use Baker’s Brand sweetened flaked coconut because it has more moisture than other brands. And did you use a regular clear honey that flows like the one in the video? Did you take time to press the batter down hard, preferably for about a minute? And did you cool the bars COMPLETELY before cutting? If all those are a “yes,” please let me know and I will try to get to the bottom of this. In fact, I will make some tomorrow and see if I can figure it out because it’s important to me that my recipes work for everyone. Thanks for your response. I will buy the coconut flakes you mentioned since mine was the target market pantry brand. The only thing I can recall is since I did not have the 9 X 9 square pan, I used a 13 x 10, perhaps the bigger pan caused it to spread out more and not thicken into bars, perhaps that was the problem? Or something else? I definitely think the larger pan size was the problem. Your finished product would have been much thinner and I would expect that the bars would have been too thin to hold together. I really appreciate you figuring this out and taking time to reply because now my confidence is restored. I’m not sure that peanut butter could replace the honey. The stickiness of the honey (which has no fat) helps to hold the bars together and peanut butter has a lot of fat so it could do just the opposite. My guess is that it would not work. You could probably add some peanut butter but keep the honey. You might have better success with a different recipe for “peanut butter granola bars” – I see quite a few of those online. Good luck! I just made them today with a one-cup mixture of toasted almonds & walnuts, roasted peanuts & pistachios, with raisins and chocolate chips. They were awesome!! I’m so gonna make them!!! Jenny, I am a newbee when it comes to baking and I have recently tried your granola recipe and it was delicious. I was skeptical because I don’t like maple syrup…it just tastes too sweet to me, but it was just right for the recipe. I even bought flax seeds to try the recipe with that next time. I just looked at your video for the granola bars and I’m going to try that next. Wish me luck! 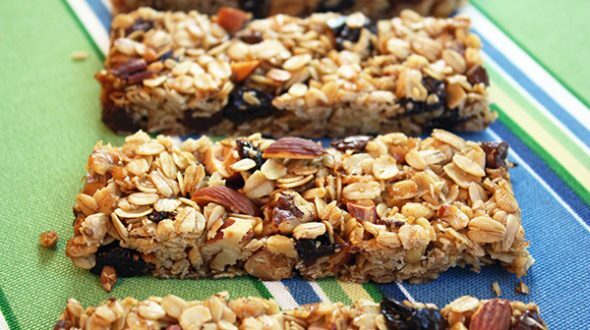 I think you’ll find the granola bars pretty easy to do – good luck! Hi Jenny. I know its been a while since my last post to this recipe, but I have tried it and I had a similar problem that the bars did not stick together. I made them several times, but they still did not work. I thought I was following everything to the t, but maybe not. Do you know if there’s another brand other than bakers for the flaked coconut because I am concerned about the preservative. So maybe because I am using the Trader Joe’s brand which has a moisture packet inside, that makes the difference in the texture of the bars. Any advice? I don’ t think coconut is the problem since a lot of bars don’t even have coconut. If you’re using a 9×9 pan my only suggestion is to press them down harder. Try putting the pan on the seat of a chair so you can put all your body weight into the pressing a and use a spatula which you press into the mixture. Also, you can press them down again after baking. Let them cool about 10 minutes and press them down firmly while they are still warm (using the spatula) then make sure you cool them COMPLETELY before cutting. I hope that helps. Great recipe, I am a big guy and love doing this recipe, I pour lots of ingredients, they are always great! I made these bars yesterday. It was my first time making granola bars. They taste great! Not too sweet but just right. Slightly crunchy on the outside too. Thank you for sharing this healthy and easy recipe. I BLAME you for this!!!!!!!!!!!! I make those… and now look what happened? I CANT STOP EATING THEM! they’re so good! Just tried your granola bars. They are delicious! I put walnuts, dried cranberries, sunflower seeds, and peanuts. It will be fun experimenting with different extras. Thanks!